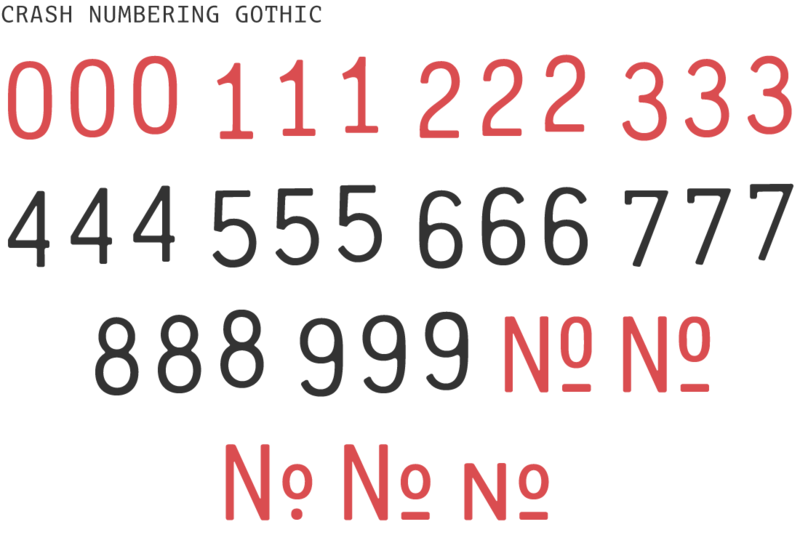 Our digital simulacrum, which we are proud to present here and now, includes Serif and Gothic styles; three variants of each numeral; and a smattering of numerical symbols. It’s ideal for numbering invoices, gift certificates, tickets, undergarments… anything that’ll hold still long enough to run through your inkjet printer. And it’s free. New in Crash Numbering Version 2.0: Shift the vertical alignment with OpenType features. CRASH NUMBERING BY PHILIP KRAYNA AND RXC. 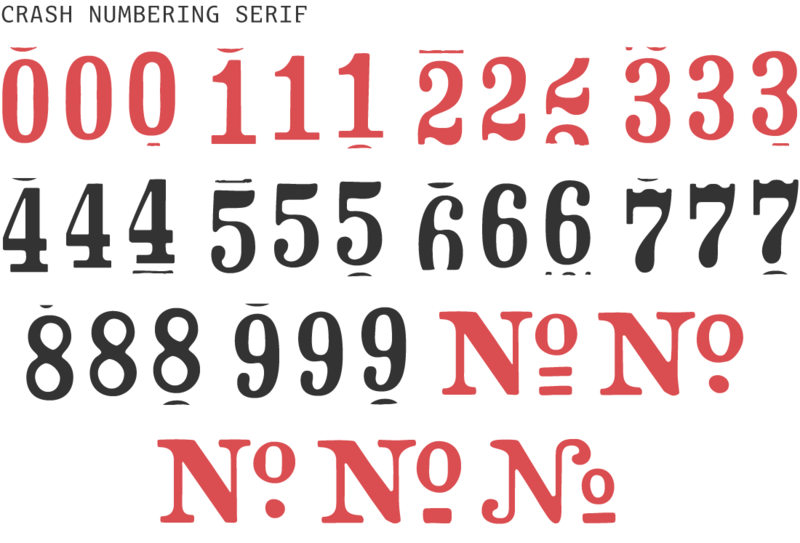 The Crash Numbering free fonts include: Multiple sets of numerals/figures and a few symbols. Different number abbreviations, are located in the Q, W, E and R keys. The pound/hatch symbol (#) is located in the Y key. The +, =, /, hyphen, period, and comma are in their standard locations. There are three variants of each numeral. The standard set is in its usual key range. Alternates which are raised above the baseline are accessible by adding the Shift key. In applications that support OpenType Features, these alternates are also accessible through the OpenType Features: Stylistic Set 01, or Discretionary Ligatures. Alternates which are slightly below the baseline are are accessible by adding the Shift & Option keys. (On the PC, the latter 0-9 set is mapped to Alt-0200 thru -0209.) In applications that support OpenType Features, these alternates are also accessible through the OpenType Features: Stylistic Set 02, or Smallcaps.